As I sit on a bench, with my head in my hands, noticeably pale-faced and feeling dizzy, three village children play around me, giggling to each other. “How can they run around like that when I can’t even breathe?” I think to myself, jealous of their ability to function here. The bravest and smallest one, rosy-cheeked Stefania, eventually sits down next to me. I guess the absence of colour in my face must’ve given it away. It takes a lot of energy just to nod. She grabs my hands. We may be in Chivay, a village deep in the Andean highlands of southwestern Peru, but in many ways Stefania is just your typical six-year-old with a vivid imagination. As a Peruvian-Canadian, I strangely feel like I’m from here, and not, at the same time. On one hand, I understand the culture and the language because while Chivay is mostly Quechua-speaking, people can also communicate in Spanish—which luckily I speak. This allows me to have memorable interactions with the indigenous people I encounter in my travels. On the other hand, being a pseudo-tourist makes me immune to culture shock but not to altitude shock, which locals refer to as soroche, a common ailment in a town that is about 3,600 metres above sea level. The symptoms of soroche include nausea and fatigue, but are counteracted by the apparent ability to strike up conversations with concerned village children. While my body is having a tough time adapting, the market in Chivay is bustling and life seems to be going on all around me. Friendly women in long, vibrant skirts and white straw hats continue selling fruit by the dozen, while jazzed-up moto-taxis zoom past. Amazingly, everyone seems to be completely unaffected by the thin air up here. Earlier today, our guide Cesar warned us that high altitude puts stress on the human body. He explained that the locals chew coca leaves in order to work the fields under these physiological conditions, a remedy, remarkably, that traces back to 2000 BC. A tastier alternative is drinking mate de coca, tea made from the leaves, which can alleviate the symptoms of altitude sickness. In this region, coca is a sacred plant and a strong cultural symbol. To help ensure a successful harvest, locals perform a challaco ritual, which involves the sprinkling of food, a purple corn beverage, and coca leaves as payment and tribute to the Andean goddess Pachamama, or Mother Earth. Marita, Sandra and Ivan, three Limeños I met on the bus to Chivay, come back from exploring the village to check up on me, only to laugh when they see I hadn’t wasted time making a new friend. They seem to be having better luck with the altitude than myself. Chivay is the first stop on our pilgrimage to the Colca Canyon, a gorge twice as deep as the Grand Canyon, where we hope to catch a glimpse of the mighty Andean condor bright and early the next morning. But first, if I’m going to continue with my story, I guess I should start with how I got here—maybe while sipping a cup of coca tea. Before hopping the bus from Chivay that morning, I had started my trip with a 15-hour bus ride to Arequipa from Lima, where I had spent two weeks reconnecting with family and friends after almost seven years of not having seen them. While I miss them already, it’s nice to get a break from the hectic life of any country’s capital city. Arequipa, the second largest city in Peru, with a population of 800,000 (compared to Lima’s more than nine million), provided just that. Legend has it that the fourth Inca ruler, Mayta Capac, was so captivated with the climate and location of present-day Arequipa that he stopped and exclaimed “Ari, quepay” in Quechua, meaning, “Yes, stay.” Needless to say, I too decided to quepay for a while. Arequipa may be a gateway to the Colca Valley, but it has plenty of its own attractions to draw visitors. The city was refounded, so to speak, by Gonzalo Pizarro in 1540 with the Spanish sweep through South America, and the elaborate architecture alone is worth the trip. The most stunnin g observation is that most of the white-walled colonial buildings are intricately carved from sillar, porous rock collected from neighbouring volcanoes. The region’s most famous volcano, the snowcapped El Misti, which is one of the farthest Andean peaks that sources the Amazon River, serves as a backdrop for the Plaza de Armas, or main plaza, of this so-called white city. A Sunday stroll through the historic centre of Arequipa revealed dozens of happy newlyweds and their large wedding parties using the plaza’s fountain, palm trees, flower beds and—in true Spanish style—a neoclassical cathedral as a photography studio. I stumbled upon a couple of ceremonies by mistake; every church within a few blocks seemed to be helping lovebirds tie the knot. The visit to Santa Catalina was highly recommended to me by my Aunt Lola, who spent years living in Arequipa. When she told me it would take almost a day to explore this monastery I didn’t believe her, but it turns out they don’t call it “a city within a city” for nothing. It also isn’t your typical monastery—it was built entirely from volcanic stones, and was founded in 1580 for nuns whose wealthy families wanted them to have comfortable lifestyles (no vows of poverty, here—the servants outnumbered the nuns!). There was plenty of space for comfort in the extensive 20,000-square-metre, maze-like layout that is complete with buildings, streets, chapels, communal kitchen and washing sector, and even an art museum with hundreds of colonial paintings. About 20 to 30 cloistered nuns still live here in an area closed off to tourists. The Spanish architecture of the monastery is characterized by tiled roofs, detailed wooden doors, and brightly-painted red and blue walls, columns and arches. There are red geraniums in pots, on windowsills and on the antique furniture of the quaint living quarters. The narrow pathways open to large, serene courtyards with orange trees. It truly is a photographer’s delight, with the interaction of light and shadows through the windows making it picturesque at every angle. My aunt Lola was right—I spent almost a whole day exploring the hidden rooms, nooks, and staircases in this wonderfully unstuffy monastery. There were only a few visitors, too, which made the setting even more peaceful. I turned a corner, startling a poor German tourist, who seemed genuinely flustered to see me. I don’t blame her; it was quite easy to get lost in your own experience here. There was a young woman who also seemed to be travelling on her own. “Do you mind taking my picture?” she asked me in Spanish. “Of course not,” I responded, and she was quick to return the favour. Eventually, this classic solo travel moment of reciprocal picture-taking led us to start a conversation, and it turns out that Grace was originally from Colombia but grew up in the U.S., and was taking time off work to travel around Peru. 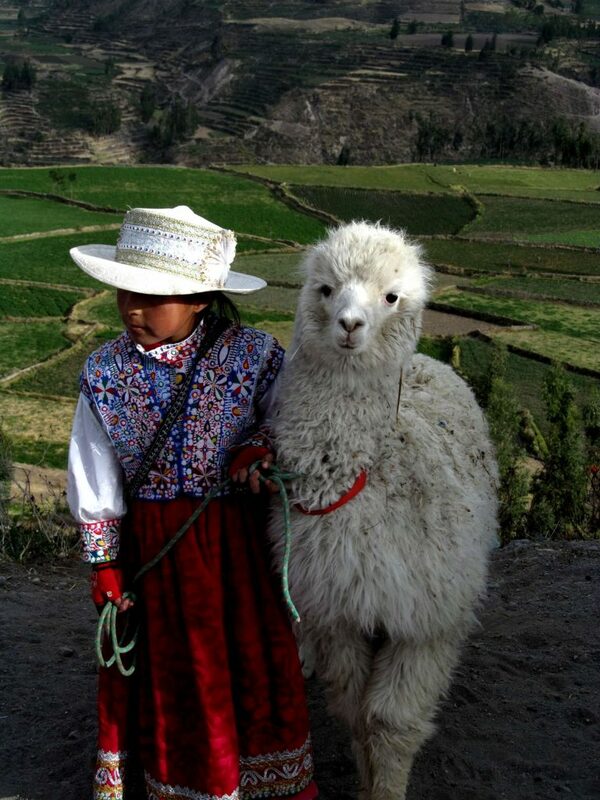 As a Peruvian who was raised mostly in Canada I could definitely relate to her multicultural upbringing. We spent the rest of the afternoon chatting in Spanglish (blending English and Spanish), and getting lost in the monastery together. For dinner, we went to a balconied picanteria overlooking the main plaza. Watching the cathedral light up at dusk, with stunning El Misti behind it, was magical. We feasted on the Arequipeñan speciality rocoto relleno, spicy red pepper stuffed with pork and cheese, and then drank coca-leaf tea. In sharing talk and travel plans over dinner, we decided it would be fun to go to the Colca Valley together. 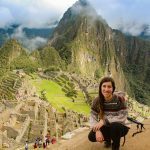 My hostel, Posada del Virrey, run by the lovely and helpful Maria, was located within an old colonial building and was a great meeting point for a spectrum of travellers hoping to use Arequipa as a launching pad for their treks or expeditions. 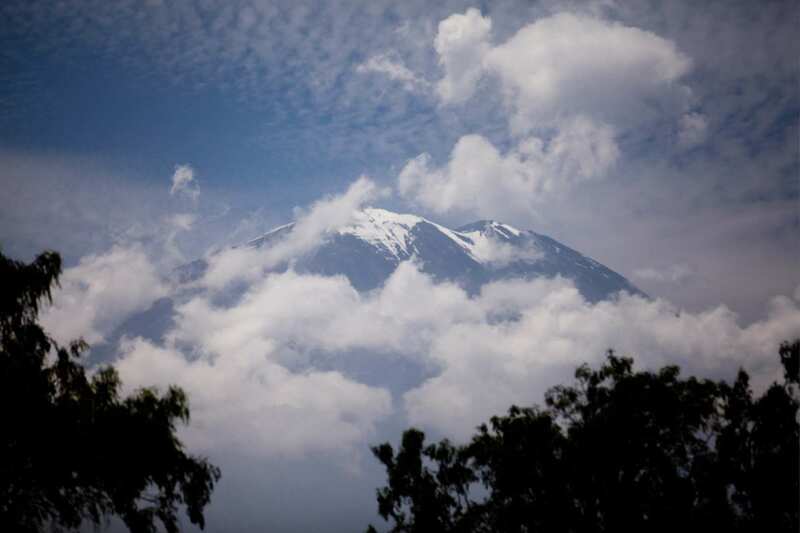 That evening, I exchanged travel stories with Markus, an adventurous German, who had spent the last three days camping in below-freezing temperatures while trekking the 5,822-metre-high El Misti. Peru offers some of the best alpine hiking in the world, and El Misti is a popular destination. Markus was off to the Colca Valley the next day as well, but doing it on his own via public transportation. Due to our limited time constraints, Grace and I opted for an organized tour. Earlier that morning Grace and I had set off for Chivay, the hub of the Colca Valley region. As our bus drove north from Arequipa, El Misti started spewing white smoke, much to the delight of the snap-happy mix of South American and European tourists in our group. The traces of civilization became fewer and far between, marked by the disappearance of smog, street dogs, motorcycles, and brick walls painted with political propaganda, giving way to the immense Andean blue sky and the seemingly untouched landscape. The flowing desert before us was dotted with vegetation and curved around powerful volcanoes that rose up effortlessly from the barren land. Tiny, straw-like shrubs sprung from the rocky ground, creating a panorama that was both gentle and harsh at the same time. The rolling hills, shaped by time and history and even patience, seemed unending. I couldn’t wrap my head around the vastness of the land in front of me. The road to Chivay, although a little bumpy, was nothing compared to what my Uncle Tony and Aunt Luzma had described. 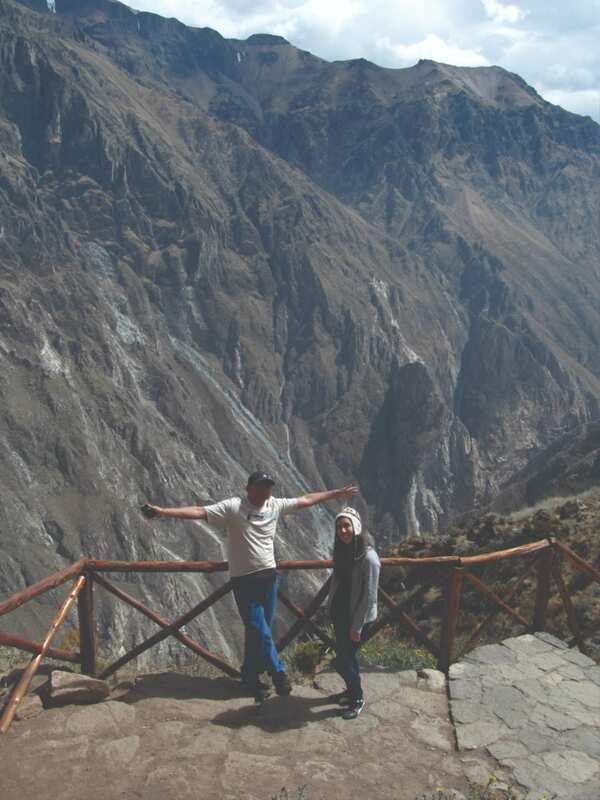 They travelled to the Colca Canyon almost 30 years ago for their honeymoon, and after hearing their stories I’m so glad the roads have been paved! I can’t imagine suffering from altitude sickness while driving along a rough, windy Andean road. Grace and I happily chewed some coca leaves on the way, which helped with the nausea but made my lips a little numb. “Everyone look to the right-hand side!” exclaimed Cesar. 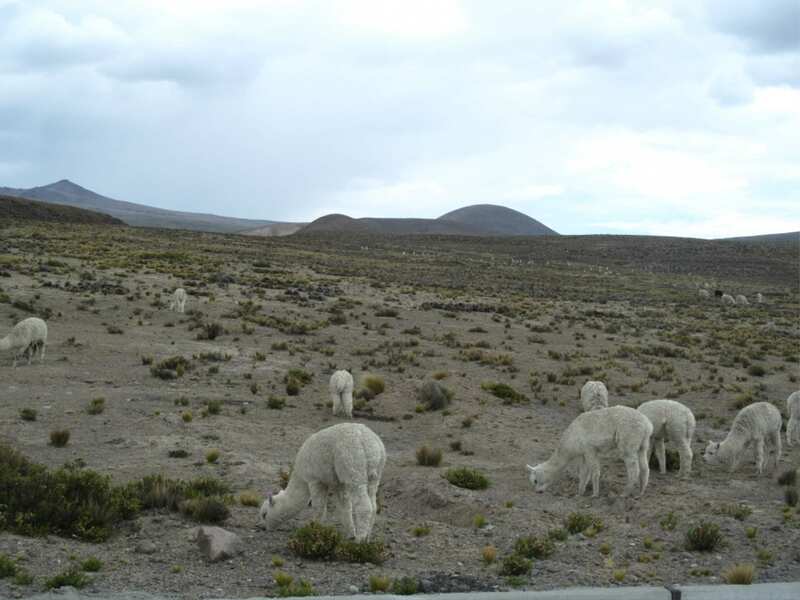 It was apparent we were in Salinas and Aguada Blanca National Reserve, because there were about 20 tan-coloured, delicate-looking vicuñas grazing next to a shallow lagoon on the plateau. With approximately 300,000 hectares protected in the area it’s illegal here to hunt vicuñas, which are often targets due to their soft fine fur. It should come as no surprise that vicuñas and their domesticated relatives, llamas and alpacas, all three of which are found in the area, are distant cousins of the camel. Their common ancestors migrated simultaneously toward Asia, Africa and South America, where they continued to evolve and adapt to very different, yet difficult environments. The dusty road continued, and we came across a herd of alpacas, and later llamas, which were feeding on different plants. Unfortunately for the alpaca, its diet makes its meat tender, and hence it’s a more popular menu item in local restaurants. Alpacas are not llamas … but close! Our bus pulled over for a bit of sight-seeing in Patahuasi, where thousands of years of wind erosion have created strange chimney-like rock formations, earning it the nickname “stone forest.” Several women sat on the side of the highway, selling high-quality alpaca wool handicrafts, and meticulously spinning fibre into yarn. A little girl was carefully grooming her pet alpaca, which had brightly sewn yarn in its ears—she let me get close enough so that its large doe eyes with their long eyelashes stared adorably back at me. 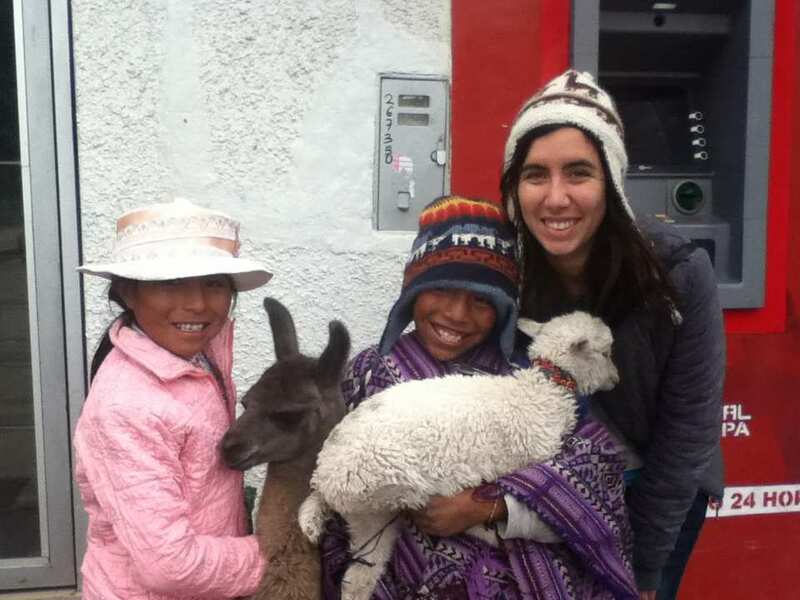 I invested in a chullo, a traditional Peruvian hat with earflaps, typical to the Andes and hand-knit by the girl’s mother—it was getting colder the higher we climbed. We continued climbing steadily until we reached the Mirador de los Andes (also called the Patapampa lookout). 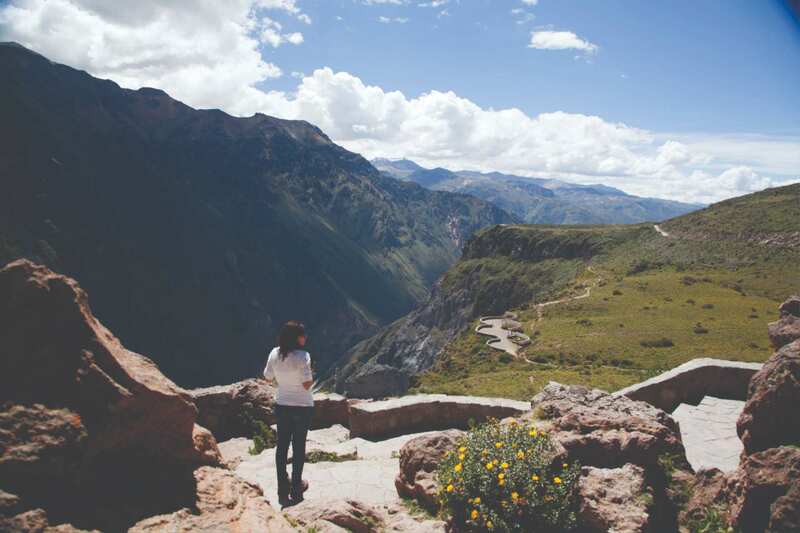 At 4,910 metres, it’s the highest point in the Colca Valley and is surrounded by soaring volcanoes. The views from this altitude were breathtaking, figuratively but also quite literally. There were hundreds of piled rock towers, called apachetas, left behind as offerings to the mystical apu mountain spirits. I don’t think the spirits were listening today, because as I built my apacheta, the heavens opened and it started snowing. And with that as our cue to leave, after nearly 160 kilometres and five hours on the road, we started our sharp descent into Chivay. 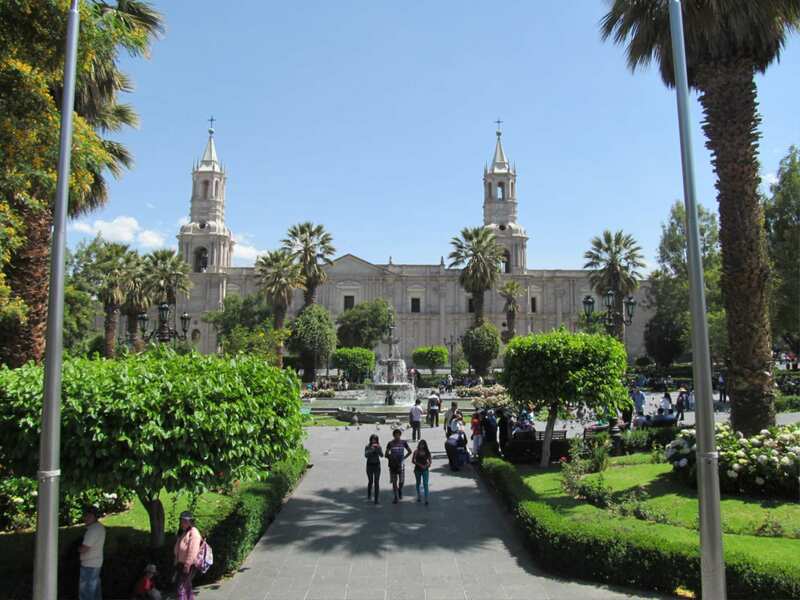 Like Arequipa, it’s no surprise that the main plaza of Chivay also has a modest church and fountain. But as a bonus it has a somewhat strange statue of Juanita, the ice mummy girl unearthed at 6,380 metres on Mount Ampato in 1995. It is thought her well-preserved body was sacrificed by the Incas to the mountain gods more than 500 years ago; the mummy itself is now located at the Museum of Andean Sanctuaries in Arequipa. My short tour of Chivay was interrupted by that brief bout of altitude sickness—and that’s how I found myself on a bench being consoled by a six-year-old. My travelling partners pick me up and drag me to the La Calera Hot Springs, insisting it will make me feel better. On our way through the plaza, we unexpectedly pass an Irish pub. The thought of drinking alcohol at this altitude makes me feel sick again, though I have to say I’m curious about the story behind an Irish pub in the Andes. Soaking in hot springs, however, sounds absolutely idyllic! The hot springs complex is made up of five thermal pools (but only two to choose from as three are reserved for locals), which are located about four kilometres from Chivay. There are lots of amenities, like showers, changing rooms and even a small cultural museum. The mineral water leaves the ground at 85°C, and is said to have curative properties. The atmosphere is mostly quiet, except for the faint adrenaline-fuelled screams of zipliners in the distance. Chivay, I’m discovering, is a good base for hiking, horseback riding, biking, kayaking, canoeing and other adventure sports, so long as outdoor enthusiasts are prepared to acclimatize to the altitude. After a long day on a bus, winding down in the pools, surrounded by rugged hills and getting my first views of the Colca River, one of the sources of the Amazon River, is a real treat. Relaxed and in top shape once again, I join the rest of the group for a night on the town, where we are treated to a folk show at a peña. The dancers show off elegant costumes—vests, skirts and hats—that are delicately hand-embroidered works of art, while their moves depict everything from the traditional harvest to themes of love and the more questionable “malaria dance.” When it’s time for audience participation, unsuspecting gringos have to lie on the ground and be flogged to rid themselves of the illness, much to the crowd’s amusement. Ivan sips a hot cocktail called Inca Rabioso, or Angry Inca, a mix of Peruvian liquor (Pisco), honey, and coca leaves, while the rest of the group dine on alpaca steaks. Everyone exchanges a “Provecho!” (“Enjoy your meal!”), while I skip on the alpaca, remembering the cuddly creature I encountered in Patahuasi. The talented band plays on pan-flutes and the dancers pull me to centre stage, placing a thick alpaca poncho over my head and spinning me in a circle. My heart is pounding out of my chest and I’m out of breath, and it’s a sudden reminder of the elevation we’re resting at. Breakfast is waiting for us at 5 a.m. the next morning. We savour the freshly squeezed orange juice and enjoy the bread of the region, which is baked in a stone oven and is amusingly flat—yet another influence of the altitude. The excitement of the day ahead is palpable, as we set off for the Cruz del Condor, a condor viewpoint above the Colca Canyon. The canyon itself is carved by the Colca River along a geographical fault line, and measures more than 100 kilometres in length, with a 1,200-metre drop (though it’s somewhere between 3,200 and 3,400 metres at its deepest point), making it the second largest canyon in the world. (Its rival, the Cotahuasi Canyon, which is not far from here, just barely beats it.) Along the upper edge of the canyon rests six quaint colonial towns: Chivay, Yanque, Achoma, Maca, Pinchollo and Cabanaconde, though within the wider Colca Valley there are 14 towns located at varying heights. We stop at Maca, where people are going about their early morning routines of watering plants and setting up market stalls. The town’s baroque church, Santa Ana, has rich, glittering altar decorations and folklore statue versions of the saints, a manifestation of the region’s fusion between religious and ancient cultural beliefs. This is a very seismic region, and Maca sits right on the fault line, which explains the abandoned stone houses and the church’s non-matching bell towers (one tower was restored after earthquakes struck between 1979 and 1991). Outside the church, an old man with a pet eagle puts a hat on my head, and before I know what I’ve signed up for he leads his winged friend to perch himself atop it. Not really my kind of morning headwear, but it makes for a great photo at a small price. I guess I got the Peruvian early-bird special. I’m loving being here—am learning so much about my own ancestry. Cesar informs us that in the pre-Inca era, about a thousand years ago, two cultures settled in the Colca Valley at the same time: the Aymara-speaking Collaguas (who hail from the Lake Titicaca region), and the Quechua-speaking Cabanas (descendants of the Wari culture). Today their descendants can be distinguished by their use of hats. In the east, Collagua descendants wear flat white hats with ribbons, whereas rounded felt hats with cotton embroidery characterize the Cabanas in the western towns. Both of which, fortunately, are less permanent fashions than the cranial deformations that differentiated the two cultures in the past. Hundreds and hundreds of years ago, these people built incredibly efficient agricultural terraces to adapt the Andean slopes to crop production. When the Incas made their appearance in the 14th century, they took the Colca Valley by marriage (professing love, not war), and further improved the terraces and its irrigation channels. From the Antahuilque viewpoint, the terraces are spectacular fields of varying altitudes that are separated by stone walls. “What you are witnessing is the perfect organic relationship between man and nature,” says Cesar, pointing to the thousands of hectares of painstaking agricultural accomplishment. The take-home message for me is proof that living with minimal environmental impact, in this day and age, is possible. These ingenious constructions create an effect that is threefold: they prevent erosion, lessen the impact of earthquakes, and harness distinct microclimates for the production of diverse crops, all while making a tough terrain suitable for agriculture. The end result is the ability to raise livestock and increase crop biodiversity, including growing more than 4,000 types of potatoes (the Andes’ gift to the world!). The Incas stored these crops in vaults called qolqas in the mountainside, giving the valley its name. 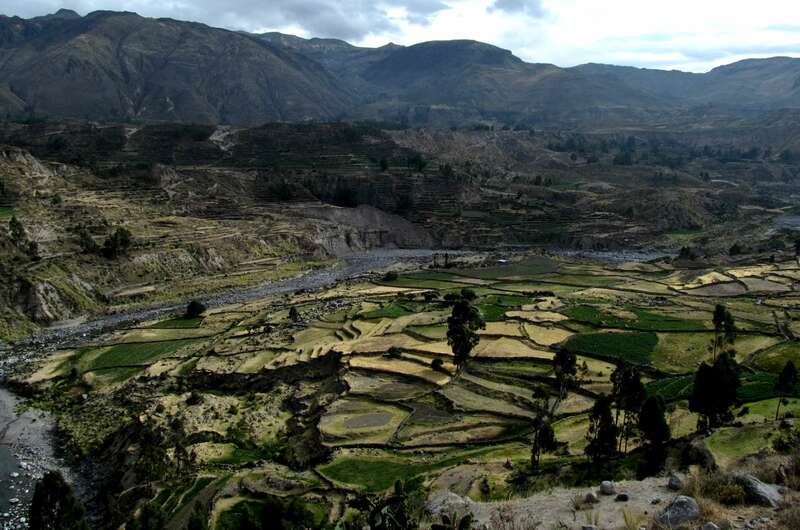 The terraces are still being cultivated to harvest quinoa, corn, potatoes, beans and barley to this day. When the Spanish arrived in the 16th century, they built the colonial towns and churches that we passed through today, in an attempt to concentrate the dispersed populations, bring farming closer to home, and for simple tax collection purposes. Forced, gruelling work in mines was introduced in the 17th and 18th centuries, and you can see it evidenced in depictions on the churches’ extravagant interiors. Aerial photography in the 1930s brought the Colca Valley to the limelight, where it was subsequently baptized as “The Lost Valley of the Incas.” It wasn’t until the 1940s that the mining road from Arequipa to Chivay was built, so it’s not too long ago that the valley opened up to the outside world. Snowcapped Andean peaks are everywhere! Our bus gets stuck for a few minutes, and we watch men in ponchos carry heavy loads on mules, while leading herds of skinny cows. I hold my breath as we pass the giant, gaping hole in the road, with the bus tires narrowly making it across two thin creaky boards. Thank goodness for Cesar’s entertaining history lesson to keep my mind off the thought of getting so close to the deadly canyon below. “Do you believe in love?” Cesar suddenly asks. We laugh, wondering where this is going. “Well, you should!” he proclaims. Condors, he explains, are completely monogamous and mate for life. According to him, when the condor’s life partner dies, the widowed bird plummets to its own feathery death within the canyon. I don’t know how much of this story is true, but he seems adamant that condors die in a tragic bird version of Romeo and Juliet. Strange—the condor doesn’t seem like the romantic type to me. It is a massive beast, measuring more than three metres in wingspan (one of the largest flying birds on the planet), and using thermal uplifts from the canyon to soar and spot animal carcasses from miles away. Allegedly, Charles Darwin once hypnotically watched a condor glide for 30 minutes without seeing a single flap of its wings. 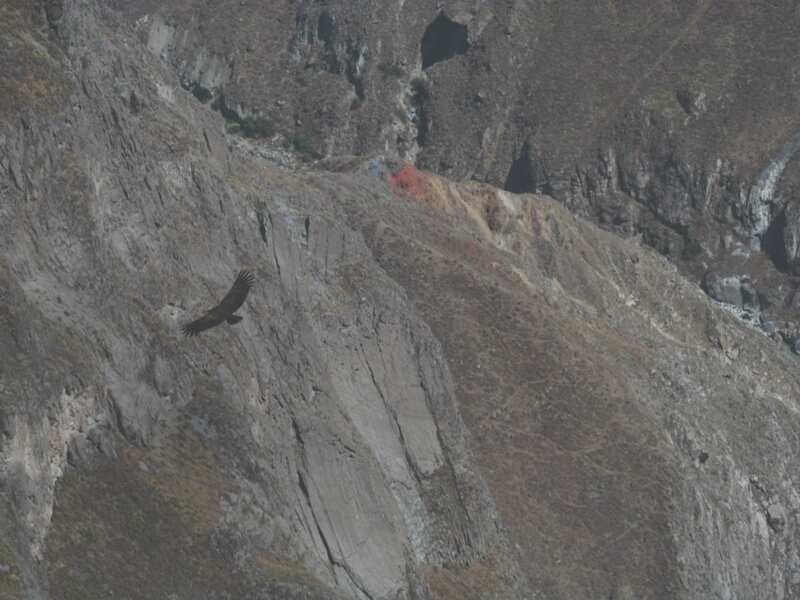 At Cruz del Condor, I hope to have a similar experience, so I fight for my viewing spot among hordes of tourists with overpowering telephoto lenses and binoculars. Locals have struggled to keep this area free of hotels; I can’t imagine the chaos otherwise. Suddenly the crowd gasps, almost in unison, as one by one condors appear on the horizon, first as small specks but then larger as they fly closer. I too stand there, completely mesmerized, watching five condors swooping gracefully, putting on a dramatic show in the crisp Andean sky. After the fantastic flight display, we trek for about an hour into canyon country, passing prickly cactuses and walking under the blazing sun toward a rainbow in the distance. I squeal as a snake slithers across the path in front of me. A dead cow lies metres away—a condor’s afternoon snack, no doubt. We keep our trek on track and succinct, but others make the steep zigzag to the bottom, going past remote villages, where a lush river oasis awaits. Just as we’re heading back, one last condor soars by, almost as if bidding us a private farewell. I came to the Colca Valley in search of the Andean condor, but found so much more. Watching the landscape transform from desert to altiplano to dry tundra, seeing Andean wildlife, volcanic peaks, mountainside villages and agricultural terraces, and learning more about this ancient mountain culture, makes me proud I get to call this country home. As we drive off, Cesar points out the Andean cliffs, and I see a cellphone tower blending into the scenery. I immediately think of Stefania and smile. Even as modern life seeps toward this once isolated place, I am confident the people here will stay true to their co-existence with nature, just as they always have. For more stories on infromtheoutpost.com PERU click here!